People are posing for portraits with fake flowers in the decor aisle of stores. In an ever-growing list of online challenges powered by social media, the latest trend proves that even amateur photographers can snap a shot in a drab location and make it look fab! Kelsey Maggart is credited with starting the "Hobby Lobby challenge" after she shared a series of portraits on Twitter that she took of her friend inside the craft store on Jan. 26. Maggart, who is a professional photographer, said she was surprised and happy about the attention her Hobby Lobby photos received. "A few weeks ago my friend said he was shooting in Hobby Lobby so we both shot there, in different stores, to compare our shoots," Maggart told ABC News. "We live in Indiana, so flowers aren’t really an option for a few more months." Maggart said that once she posted the photos she was "shocked" to see the reaction on social media. The craft store photoshoots have since moved outside Hobby Lobby stores and into WalMart, Michaels, Target and other retailers. People started sharing their own pictures using the hashtag #HobbyLobbyChallenge and have now moved onto the broader based #uglylocationchallenge. One participant told ABC News that after several of his friends saw Maggart's tweet, they challenged him to "do something like it." (Clay Daugherty) Clay Daugherty took pictures of his friend at Hobby Lobby as part of the viral internet challenge. "I asked my friend Samantha to do the challenge with me and she was super excited," Clay Daugherty said. 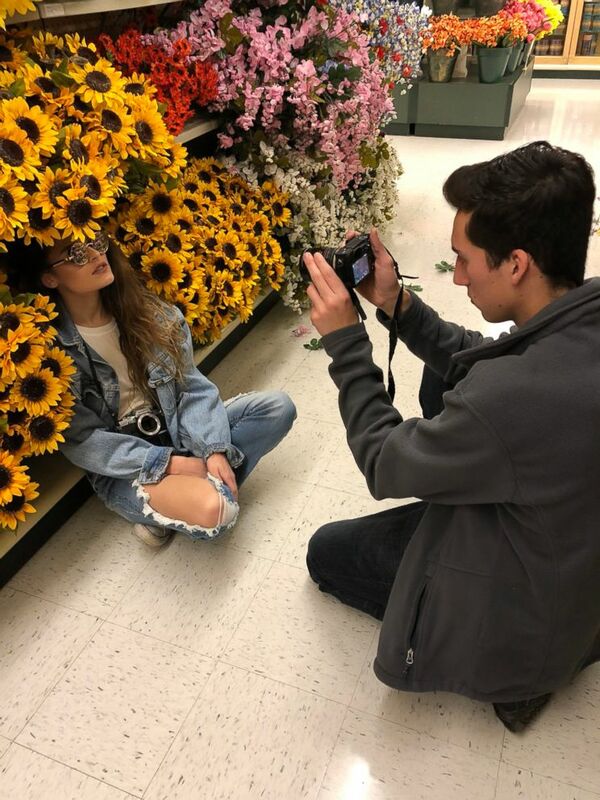 "We decided to go to Hobby Lobby because we knew they had a flower aisle and we thought that would be an amazing place to do it," he explained. Daugherty added that he wishes he had thought to post his photo first to get the same social media traction, but overall he was happy to participate. "After I posted my tweet, some people had sent me [Maggart's] tweet of her shooting in Hobby Lobby. I was a little sad that I didn’t post the Hobby Lobby ugly location challenge first, but the pictures turned out great and I had a lot of fun," he said. (Google Maps) Hobby Lobby in Indianapolis, Indiana. Hobby Lobby did not immediately respond to ABC News request for comment.